The Crook County Cowboys couldn't have picked a worse time to struggle. 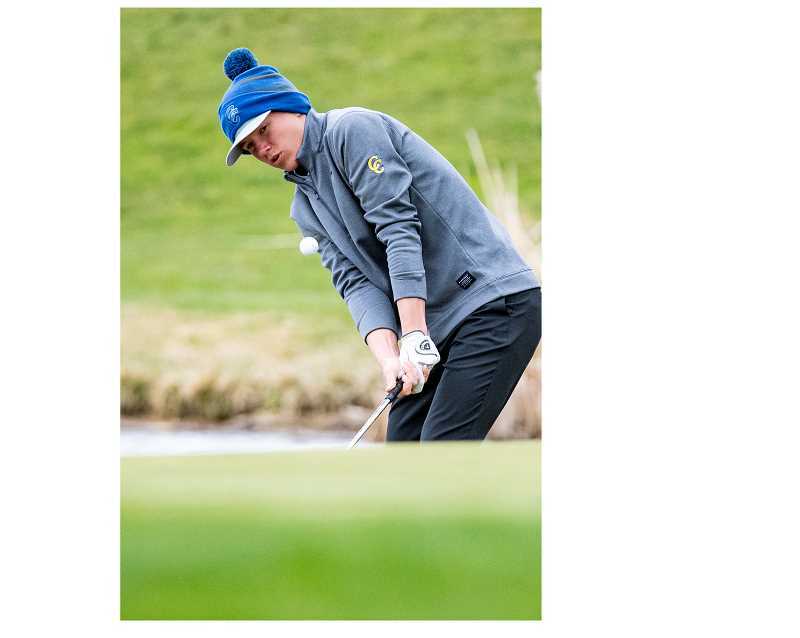 After shooting lower scores in their first two tournaments than in any tournament a year ago, the Cowboys shot their worst round of the season on Monday in the opening round of Intermountain Conference play at Indian Creek Golf Course in Hood River. "We struggled a little bit," Crook County head coach Zach Lampert said. "The weather was real tough, but it's also a quirky golf course with lots of local knowledge, and none of our kids had seen it before. I definitely think that played into it." Lampert added that the weather was so bad during the first couple of hours that coaches considered suspending play. Not only were there high winds and pouring rain, but there was standing water on the greens. "It just poured rain for the first couple of hours to the point of it almost being unplayable," Lampert said. "But we powered through and then it started to clear off towards the back nine, so they were able to finish, but it was tough. I'm not sure we handled the rain that well. It's just not something that we are used to." The Cowboys posted a round of 394 on Monday, nearly 50 shots poorer than the round of 347 that they shot on Friday at Meadow Lakes. Ridgeview won the tournament with a score of 346, while The Dalles was second, 349, and Hood River Valley third, 367. Crook County's score was good for fourth place, while Redmond finished in fifth, 421, and Pendleton trailed the field with a score of 452. Lampert noted that both Hood River Valley and The Dalles were familiar with the course, while Ridgeview traveled to Hood River early, playing a round of golf on Sunday to prepare for the tournament. "We just don't have the budget to be able to do that," Lampert said. "It's not a real long course, but there are a lot of doglegs and ups and downs and hidden shots and stuff that if you haven't played there, you are probably not going to know what to do that first time. Crook County hasn't been to Indian Creek in Hood River since I played, so that's been 12 years or something." Lampert added that the Cowboys are much more familiar with the next three courses in the four-tournament series. As expected, Ridgeview's Isaac Buerger took first with a two-over par round of 74. Tyler Vaser of The Dalles was second with a score of 75, while teammate Aidan Telles was right behind with a round of 76. Trenton Brinkley was the low-scoring Cowboy, finishing 10th overall with a round of 93. "I thought that Trenton did well," Lampert said. "He definitely played the best of the group. He's been pretty steady and our most consistent player for the first three weeks." Brodie Kuizenga was next in for the Cowboys, finishing 11th overall with a round of 94. Hogan Smith was next in for Crook County with a round of 102. "Brodie struggled out of the gate and never quite got it going," Lampert said. "Same thing for Hogan." Cayden Lowenbach was the final Cowboy to count in the scoring, taking 18th overall with a score of 105. Although he did not count in the scoring, Carlos Sanchez finished with the same score, taking 19th overall with a round of 105 in the first varsity action of his career. With the top team from the four league tournaments automatically qualifying for the state tournament, Ridgeview took a giant step forward with Monday's victory. The Ravens picked up 10 team points for the win, while The Dalles earned seven for second, Hood River Valley five for third, and Crook County four for fourth. Whatever team has the most points at the end of the final league tournament advances to state, while the next three teams advance to a regional tournament where they will attempt to qualify. "Obviously, our first goal is that we would love to make it to state based on these league matches," Lampert said. "But I think for us, realistically, we definitely want to make it to the regional event, so being one of those top four teams is key. We didn't play our best, but we did finish fourth, so we got some points." Not only do teams earn points during the league tournaments, so do individual players, with the top two also earning trips straight to the state tournament. Buerger picked up 30 points for winning the event, while Vassar earned 25 for second and Telles 22 for third. Points are awarded through 17th place, so Brinkley picked up 8.5 points, Kuizenga 7, and Smith 1.5. The Cowboys were on the road again on Tuesday as they played in the Summit Invitational at Tokatee Golf Course. The team then resumes their league schedule on Monday, April 15 when they play at Eagle Crest Resort with an 8:30 a.m. tee time. "We have more knowledge of the next three courses, so maybe that will be to our advantage over The Dalles and Hood River," Lampert said. The third leg of the series will be at The Dalles on Monday, April 22, while the series finishes on Monday, April 29 at Meadow Lakes Golf Course in Prineville. Team scores —1. Ridgeview, 346. The Dalles, 349. Hood River Valley, 367. Crook County, 394. Redmond, 421. Pendleton, 452. Top 10 — 1. Isaac Buerger, Ridgeview, 74. 2. Tyler Vassar, The Dalles, 75. 3. Aidan Telles, The Dalles, 76. 4. Emmett Hagen, Redmond, 82. 5. Justin McMahon, Ridgeview, 85. 6. Chad Klass, Hood River Valley, 87. 7. Ren Tappert, Hood River Valley, 88. 8. Dylan Bojanowski, Ridgeview, 90. 9. Owen Clemett, Hood River Valley, 93. 10. Trenton Brinkley, Crook County, 93. Crook County (94) — Trenton Brinkley, 93. Brodie Kuizenga, 94. Hogan Smith, 102. Cayden Lowenbach, 105. Carlos Sanchez, 105.